I was a little nervous about trying this. I've never used E6000 glue before and I didn't want to put in all kinds of work, wash it and have all that work go to hell. My friend assured me it was very washable. It also doesn't adhere to skin the way super glue does. It can get a bit sloppy and create 'strings' of glue similar to that you get from hot glue. 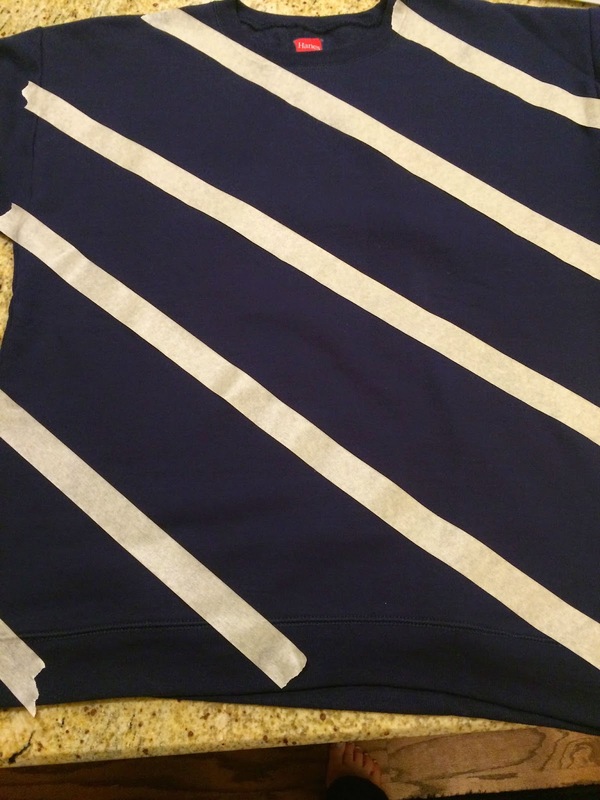 I grabbed an XL navy sweatshirt from the boy's section for $5. The glue was $3, and the crystals were $3 a pack. I would recommend not using the same crystals. The crystals stayed on just fine when I washed it, but the color did not. Many of the red colored ones are now white. You can get many wholesale that are Swarovski online or just go with a white/clear color if you decide to do this. You will need between 420-450 crystals. Grab some masking tape, tweezers, and a paper plate for this, too. Place newspaper inside your sweatshirt so the glue doesn't seep through. Tape off your sweatshirt in one direction. You could even try a windowpane pattern if you want. I find diagonal is a bit more forgiving with spacing so just eyed it and didn't measure or anything. Squeeze out glue onto the paper plate, about a grape size glob at a time. Use your tweezers to dip a crystal in one at a time and place it along the taped lines. I avoided the collar and hem and only did the body of the sweatshirt. Each pack of crystals (approximately 70) took me about 15 minutes so I would do a pack at a time whenever I had a few spare minutes. Otherwise this would be pretty tedious to complete. After finishing one direction take the tape off and let it set for a day or two before putting on tape the opposite direction. After finishing one direction take the tape off and let it set for a day or two before putting on tape the opposite direction. This is to make sure the glue has time to fully cure. Glue on crystals and let the glue cure for another 1-2 days before wearing. The glue dries clear, so getting a little in between the crystals isn't noticeable, just make sure not to get it anywhere else because it will not come off. Have fun with it! I wish I was half as crafty as you are. Love your sweater! I so love this idea. I going to have to give it a try. What a great idea. 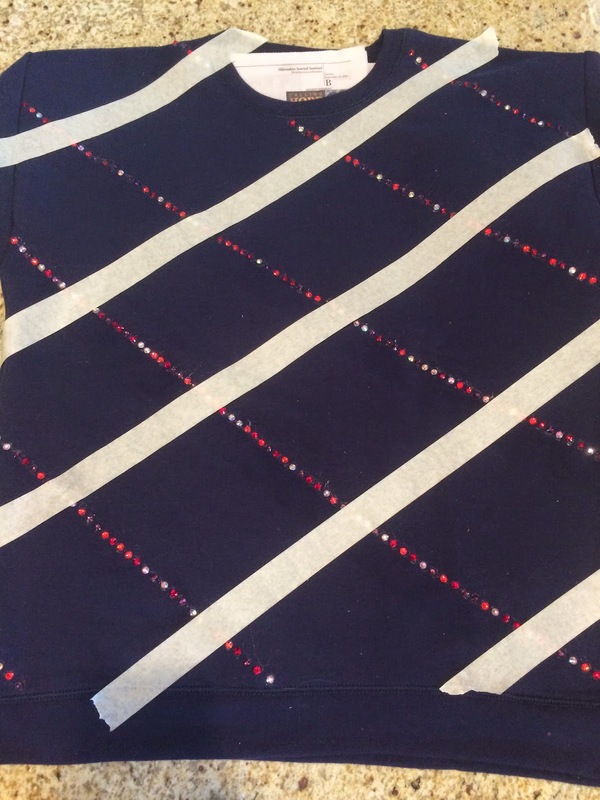 E6000 is actually great for clothing DIY, but I usually walk right by rhinestones thinking they're so not my thing - but this is so subtle! Very pretty and chic. wow that's awesome and so easy to do. How are you so crafty - and when do you find the time?!? Love it! love your diys! happy weekend, laura! You have had some great DIYs lately! 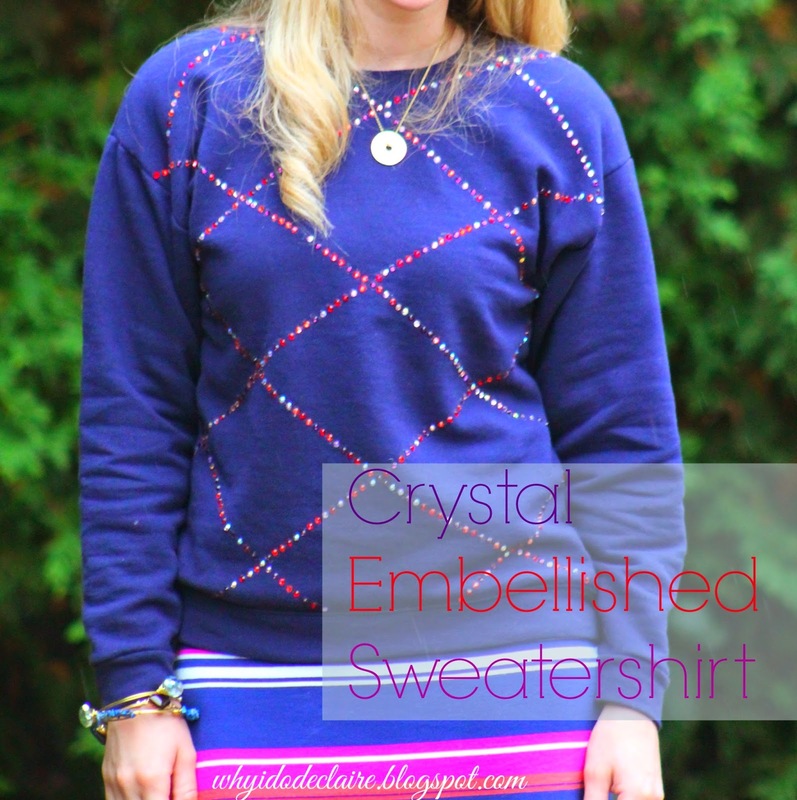 This sweatshirt is perfect with your skirt. You get better and better each time: so creative and pretty. Love the reds & pinks. I made an announcement about a Pink-themed week on the blog today. Please link up this post and some more pink if you wear, starting on Wed Oct 22nd. =) Thanks! What a cute project! I love that you can be so creative and make pieces your own. What a fun way to work an embellished number! How smart you are! I was wondering how you were able to make all beads stay on straight line before I read it. You are so creative! 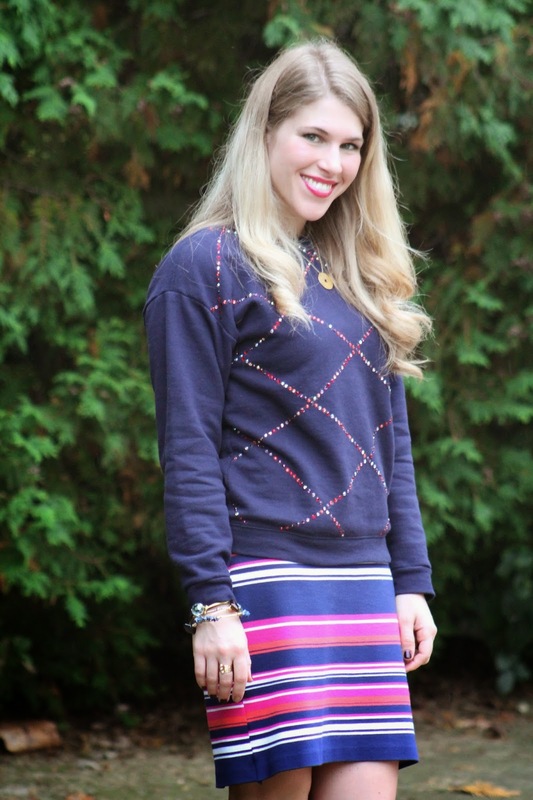 I love how your sweatshirt turned out and it's perfect for that skirt! A blusa ficou maravilhosa amei a dica. Curta e siga o meu canal, bom final de semana. What a lovely DIY sweatshirt! Thank you for sharing! You are so creative Laura! I cant sew or do what you do! Such a great idea, a one of a kind! a chance to check out my blog I would be delighted, thanks! Now this is a DIY that I actually want to do! Love this idea! Your sweatshirt looks great! I really love the criss-cross design. This seems like an easy DIY Christmas present. Bookmarking this page! Love your sweater. I want to make my own now!